Sometimes it's the simple pleasures in life that can feel the most rewarding, especially after a long day. It pays to be able to unwind and relax outdoors, and there's something to be said about sitting out by a fire. It may not be cold out, but there's a sort of comfort to having a little fire going as you take it easy. That may be one reason why so many people are excited to have firepits in their backyards. There's more to a firepit than a hole with some logs in it or a small/portable outdoor fireplace. By discussing a firepit with experts in landscape design, you can actually create a backyard fixture that brings out the personality of your home. When you're entertaining company, it's sometimes nice to have a space to convene to or congregate around. A firepit is a perfect example. It's a great place to chat after a meal, to sit back after a long day, to bond with the kids (maybe even roast marshmallows), or to enjoy a quiet and romantic evening with someone that you care about. There is something all-purpose about it, given how it can function as you entertain. There are many concerns when it comes to firepits that people sometimes don't consider. There's the obvious nature of design, for instance, and knowing what you want the firepit to look like. Position of the firepit in the yard is also important, as are the dimensions of the pit and the kind of fuel that will fuel the fire itself -- some prefer wood, while others may like gas, for instance. 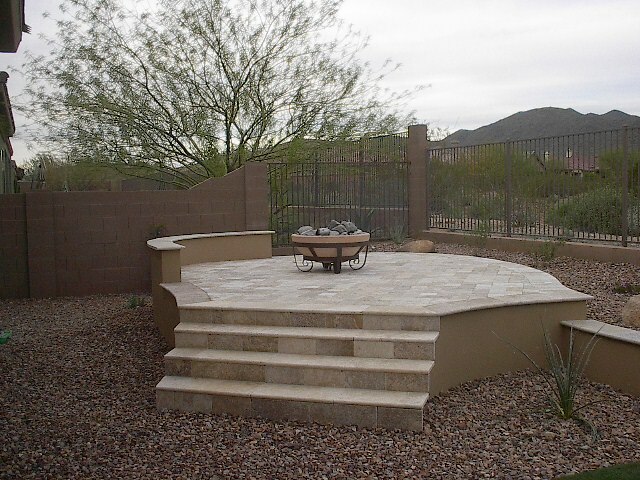 You'll often want to consider furniture and other fixtures that go around these fire pits, as well as materials and hardscape matters that may affect construction. One major thing that people neglect to think about is safety. In addition to making sure the pit and the things around it look great, you've got to make sure that nothing will catch fire, that the fire will not get out of hand or can be put out quickly, and that all of your family and guests will be safe no matter what. Can I make my own firepit? Sure you can, and you can also purchase one of those portable fireplaces/pits we mentioned earlier. These store-bought ones tend to lack a certain character, however, since they are mass-produced and never designed for your own backyard specifically. In addition, building your own firepit may be easier said than done if you are not familiar with the nuances of materials and design. These are just two compelling reasons to consider the help of landscaping and hardscaping professionals when it comes to firepits. 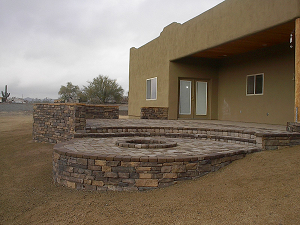 Our team has years of experience creating, crafting, and designing patio kitchens, firepits, and other outdoor items that bring out the best in people's homes. We offer you this know-how that will stress complementary design aspects, pure functionality, and an eye for safety as well. 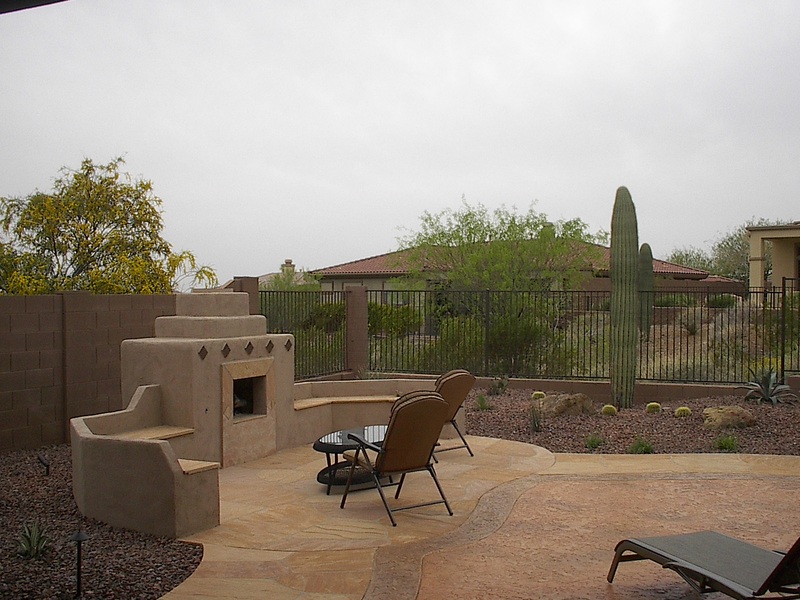 For more information about firepits and many other matters related to patio design and landscaping, be sure to contact our Arizona landscape and hardscape design experts today. By getting in touch with us, we will be sure to unlock the potential of your design concept and bring out the best qualities of your backyard.